Upon returning to Colorado from Argentina in the winter of 2006, I started mentioning the idea our own expedition to Denali for the following year and immediately Kristine was on board. 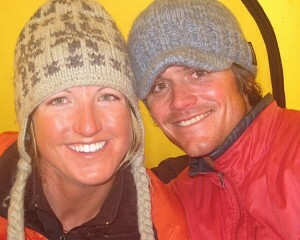 We were not dating at the time yet good climbing buddies and I knew she would be a very strong team member. 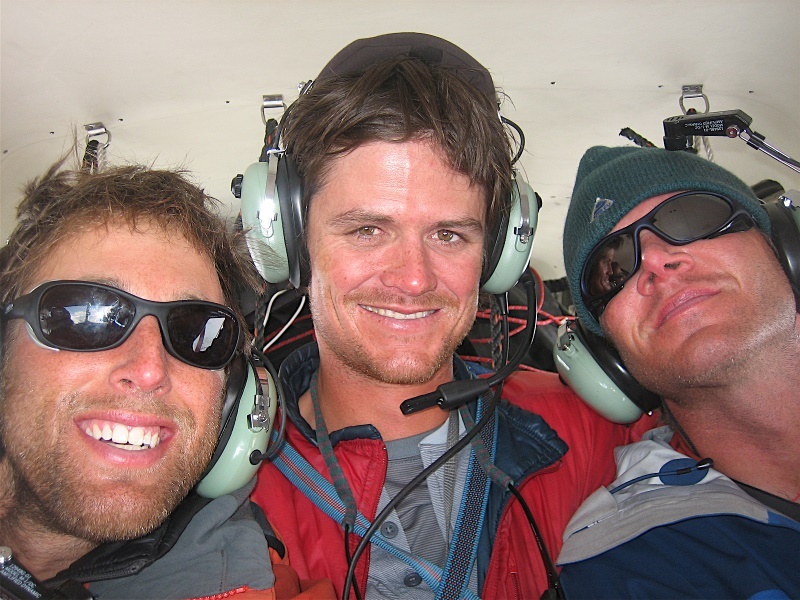 Our good friend, J Weingast, also immediately signed on and the three of us begin planning for Denali in 2007. After months and months of logistical planning, preparation, climbing and skiing Colorado 14ers every weekend in April and May of 2007, J, Kristine, and I flew to Anchorage with 500 lbs of gear in tow. Kristine and I had also started dating 2 months prior to us climbing Denali which made this climb extra special! 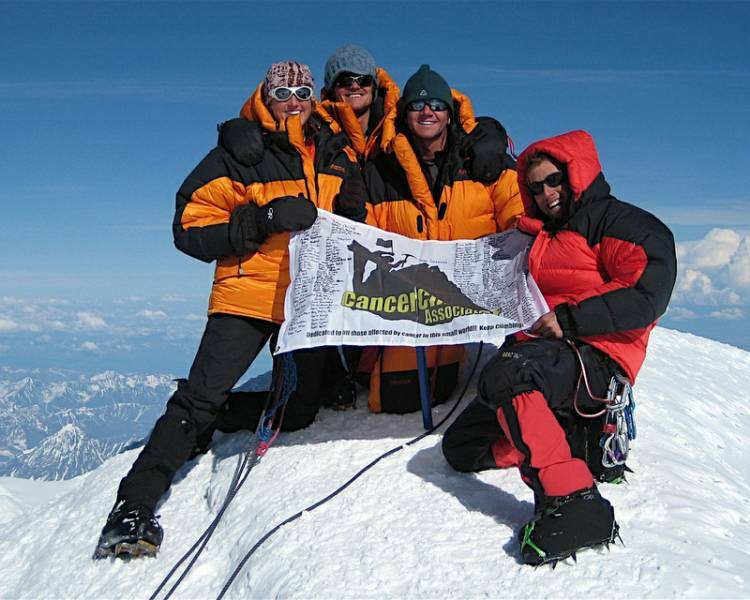 Our 4th team member would be Sean Swarner, a cancer survivor and climber living in Boulder, CO, aspiring to climb the 7 summits. 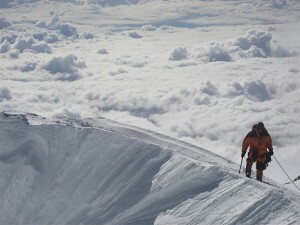 He had climbed all but Denali and had attempted it twice before with the most recent attempt in May 2007. We were wanting a 4th team member for safety reasons on glacier travel and crevasse rescue and heard he was looking for a team to go with again in June. After many conversations and coordination, Sean was on board and would be our 4th team member. Our friend Rob Baird picked us up at 3am from the airport in Anchorage. Lucky for us, Rob was a caretaker of a house in Anchorage and we were able to stay with him before and after our climb. We met up with Sean who flew up to Anchorage separately and we spent 2 days shopping for supplies and organizing 25 days worth of food. We then took a 2 hr shuttle to Talkeetna, a town just south of Denali National Park, unloaded all our gear at the Talekeetna airport, checked in at the Denali National Park ranger station and got our permit. We had made reservations to fly with Talkeetna Air Taxi into 7,200′ basecamp on the Kahiltna Glacier near Denali. While waiting for our plane, we saw a Czech team coming off one of the planes and they looked like they had been through a war and were not talking to each other. They looked as if Denali had completely defeated them. This was a little intimidating and I sure hoped we didn’t have the same fortune as their team. 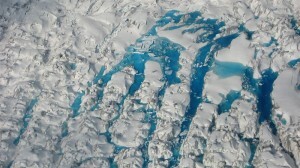 The flight onto the glacier was fantastic. J was a good co-pilot and his mouth was wide open in awe of the scenery the majority of the 30 min flight. It was cloudy and spittin snow when we arrived at 7,200′ basecamp but not too cold. We set up our tents, cooked dinner and went to bed. 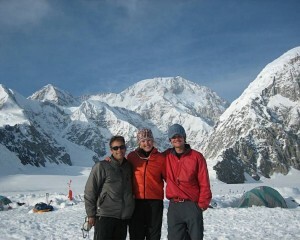 I think some of the best nights of sleep and longest nights of sleep I have ever gotten were my 1st 5 nights on Denali. We generally went to bed when the sun went behind the mtns around 8-8:30pm (it never fully set below the horizon because of Alaska’s latitude) because it was too cold to stay up hanging around outside and generally got up in the morning after the sun rose over the mtns around 8-8:30am. It was pretty nice. We moved camps continuously every day the 1st 5 days and took advantage of the fact that we are from Colorado and live at 8,000′ and didn’t need to acclimitize to the lower elevations. However, the lower sections of the mtn posed some of the more dangerous obstacles, in my opinion – crevasses and glacier travel. 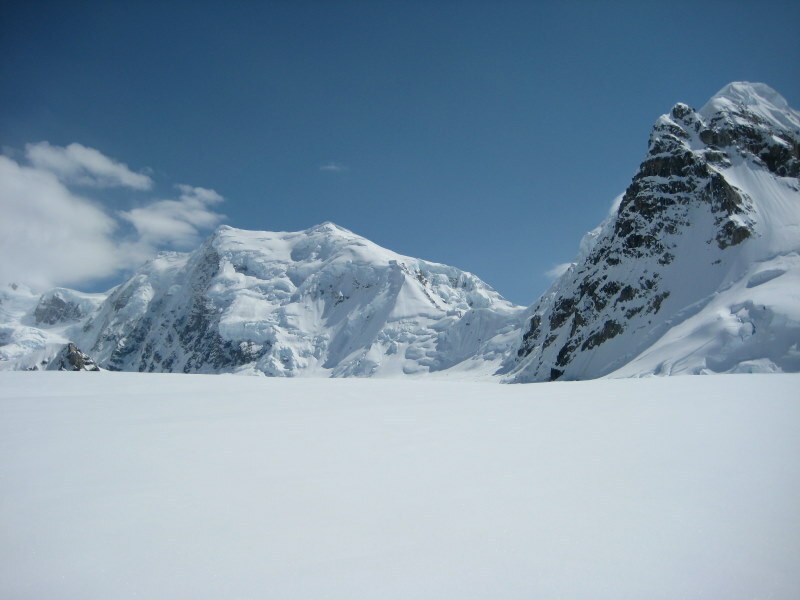 The route was pretty well wanded and traveled from all of the guided groups; however, we still had to be on our toes and communicate well while crossing snowbridges and yelling “slot!” so our group was aware there was a crevasse under us. We each had about 40 lbs of personal gear on our backs and each pulled a 60 lb sled full of group gear (fuel, food, stoves, wands, etc. ), so it was not a light load by any means. 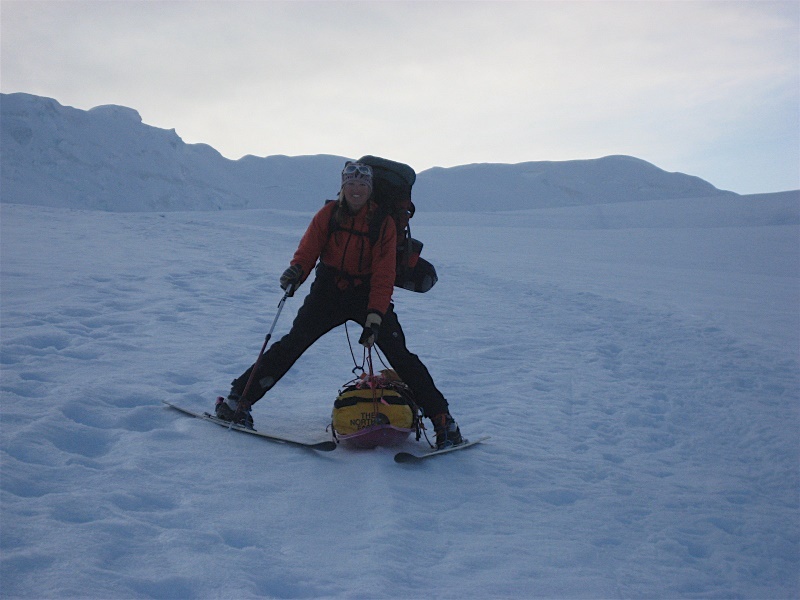 Climbers usually utilize sleds because most cannot carry nor fit 100 lbs worth of gear on their back. Above all that, we were all skinning on our skis in our mountaineering boots and tethered together, as were our sleds, on a 60m rope. 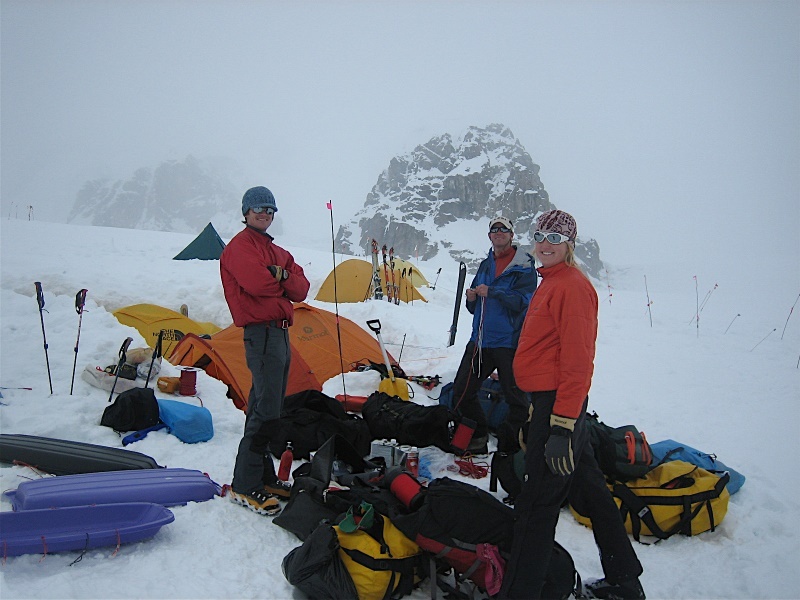 We had all our prusik knots and slings, pulleys, and snow stakes readily available on our harnesses and packs in case someone fell into a crevasse and we needed to get them out. 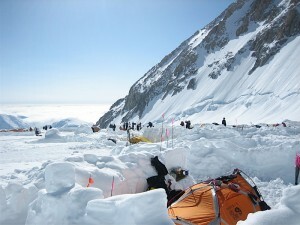 Day 1 we moved 6 miles and only 600′ up the Kahiltna Glacier to camp 1 at 7,800′ where we had a fantastic vew of Denali. Day 2 we moved only 2-3 miles but almost 2,000′ up to camp 2 at 9,600′. Day 3 we moved only a mile or so and 1,400′ up to 11,000′ camp 3 – this was a pretty short day and we relaxed all afternoon in camp 3. 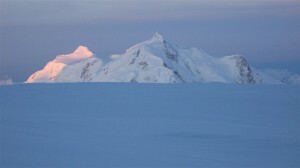 In fact, just before departing camp 2 to camp 3 is where Dr. Rob Casserley asked me if he could borrow one of our stoves. Rob and his buddy Kevin were passing through camp 2 shuttling gear. Day 4 we shuttled gear from camp 3 to around 13,000′ just above “Windy Corner”, cached the gear (buried it in the snow), and marked the location with our wands. This is a very scenic portion of the lower part of the West Buttress route, our intended route. We then returned back to camp 3. Day 5 consisted of caching our skis, skins, and a couple days worth of food at camp 3 with wands (in case we got stranded there on the descent because of storms), packing up our remaining gear, and climbing with our crampons to out cache at 13,000′. 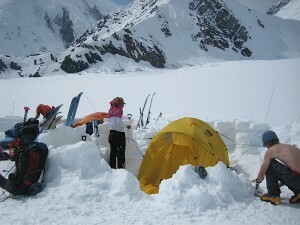 We then picked up all our cached gear and climbed the rest of the way to the busy 14,000′ camp 4. This last 1,000′ to camp 4 was very tough because of the enormous loads we were hauling on our backs and sleds. It was a huge relief to get to camp 4 especially after having been on the go for 5 days straight. 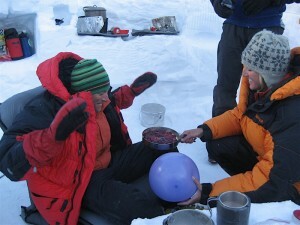 Day 5 was in fact J’s birthday and Kristine made a delicious cheesecake and surprised J with it and a birthday balloon! I didn’t even know she brought the fixings along to make a cheesecake at 14,000′. Day 6 was a nice relaxing rest day at 14,000′. 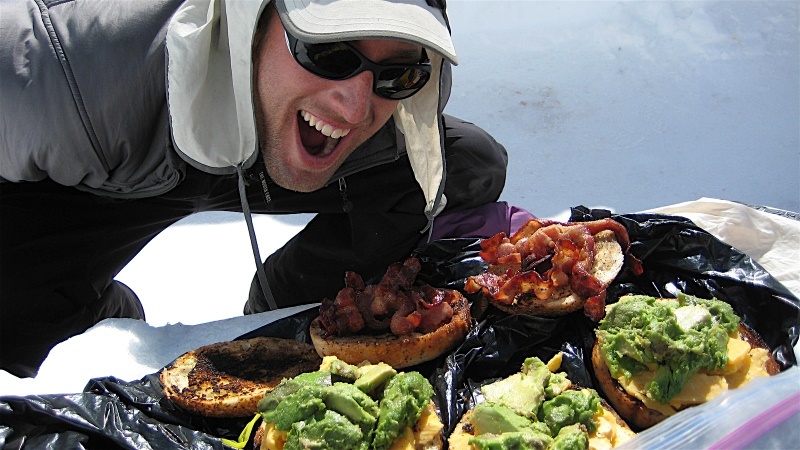 We had the best meal of the expedition for lunch – avocados, bacon, and melted cheddar cheese on buttered, toasted everything bagels. It was great! Rob and Kevin meandered into camp 4 later that afternoon and it was good to see them again. There were probably 100 or so climbers at camp 4 at any one time and a full time ranger tent and medical tent. 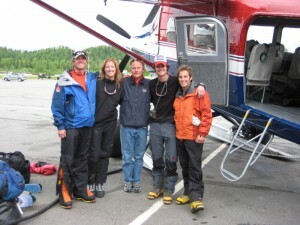 The rescue helicopter landed that day to take an injured climber back down to Talkeetna. We had met a team of skiers from Crested Butte, CO, a few days back and they were skiing some lines down from 17,200′ high camp when one of them tore his ACL on some blue ice beneath the snow. We felt bad for the guy as they seemed like great guys. Anyway, he got airlifted away. Day 7 saw us set out from camp 4 to shuttle our gear to the vicinity of Washburn’s Thumb (a rock formation named after the pioneer of the West Buttress route, Brad Washburn) on the ridge between 16,000′ and 17,200′ high camp. 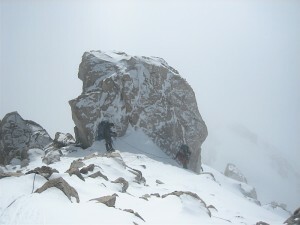 The crux is a 45-50 degree 800′ headwall just below the 16,200′ ridge. There are ropes fixed with snow stakes up the entire headwall to help safeguard a potential fall. The park service puts these ropes in every year before the climbing season to minimize potential accidents and I’m glad they do! If I had a 5 lb summit pack, the slope would be something we are used to climbing back in CO without ropes. But, carrying 50 lbs on your back at almost 16,000′ on a steep slope makes you certainly glad there is a fixed rope to clip your ascender into. The process of ascending the headwall was pretty slow being all roped together and having to clip and unclip your ascender every time you came to a snow picket, but we made it to the 16,200′ ridge. We then climbed to just below Washburn’s Thumb and cached our gear and food to be used up higher at high camp and on summit day. We then returned to camp 4. Kristine broke her personal altitude record this day by ascending above 14,433′ (Mt. Elbert’s height in CO). Our solar powered weather radio predicted bad weather above 16,000′ for the next day, Day 8, and it turned out to be fairly accurate. So, we stayed at camp 4 and took a walk out to the “Edge of the World”, the edge of the plateau camp 4 sits on where you can peer 7,000′ almost straight down. Day 9 we packed up camp and climbed to our previous cache just below Washburn’s Thumb and loaded up our packs with the buried gear and food. My most difficult section of the entire expedition was climbing from 16,200′ to 17,200′ high camp with a very heavy 60-70 lbs on my back. At times this ridge is pretty exposed and knife-edge but the views are incredible. 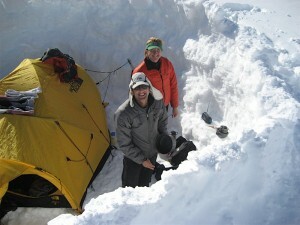 We finally reached 17,200′ high camp (camp 5) in the clouds and it was snowing lightly. We quickly set up camp and Rob and Kevin had climbed just behind us from camp 4 and set up their tent next to us. We cooked dinner and listened to the radio for tomorrow’s weather. The weather looked very favorable with cold temps but clear blue, sunny skies. We didn’t actually start climbing on summit day, Day 10, until, believe it or not, 10:30am! Quite different from our early 3am-4am Colorado alpine starts. But, it didn’t matter because its light all the time in the summer in Alaska and the weather looked clear all day. It took us over 2 hrs to ascend to 18,200′ Denali Pass from high camp primarily because we got stuck behind a couple guided groups with our late start. 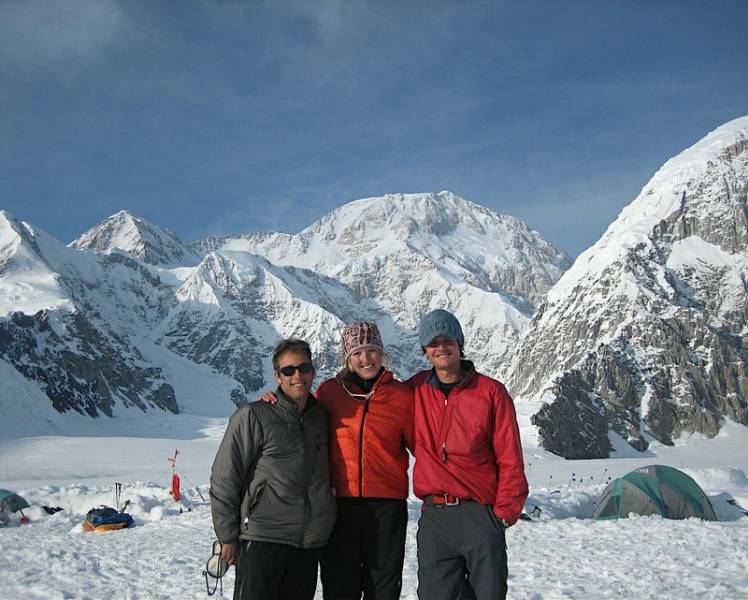 Nevertheless, we met up with Rob and Kevin at Denali Pass and started our climb up the long ridge to Denali’s summit, over 2,000′ above. It was sunny and clear but bitterly cold and eventually we were at the bottom of “Pig Hill”, the long slope up to Denali’s summit ridge. We dropped our packs, put everything we needed in our 8000m down parkas (water bottles, food, cameras, etc) and ascended Pig Hill. 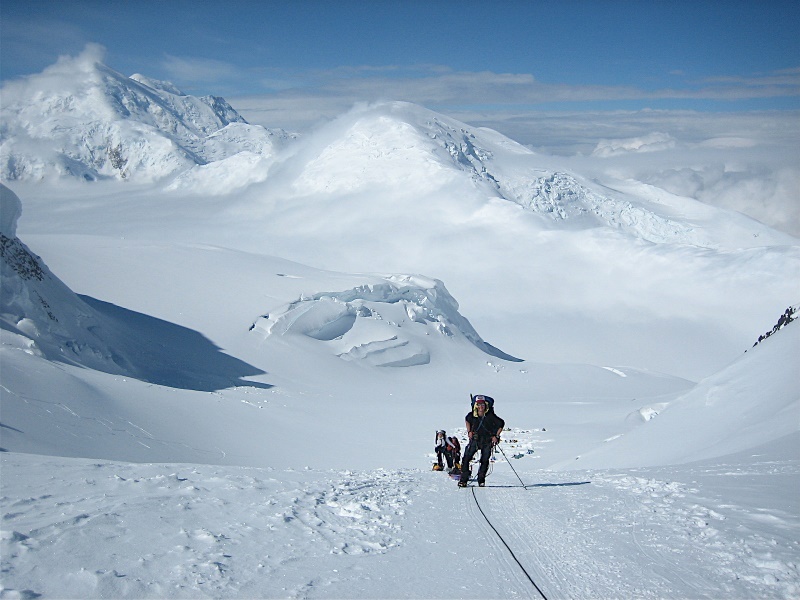 Denali’s summit ridge is nothing short of spectacular with the amazing views and exposure it has to offer. There were a few sections of fixed lines that we clipped our ascenders into and finally met up with Rob and Kevin again a hundred feet below the summit on their way down. 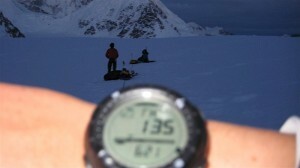 Then, around 6:30pm on Tuesday, June 19, we reached the summit of North America! Its amazing that it took us 8 hrs to ascend just over 3,000′ because in Colorado, we typically ascend 3000′ in less than half that time. However, altitude and cold really play the main role in slowing your pace down. We celebrated and called our families from our satellite phone. Sean was especially emotional since this was his final 7 summit and it had taken him 3 attempts to make the summit of Denali. We took some video footage of Sean making his last steps to the summit which was later aired on ESPN and Denver local news. It was such nice weather and fairly warm for 20,320′ that I was able to take off my 8000m parka. I was pretty ecstatic at reaching my 2nd 7 summit and especially because Kristine and I were able to climb our 1st 7 summit together. 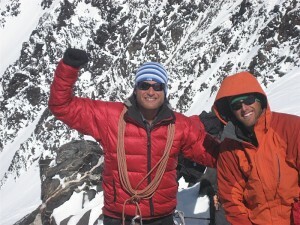 I was so proud of our team and so happy we had been so fortunate on our ascent up Denali. After 45 min or so on the summit, we descended the summit ridge and back down to 17,200′ high camp. 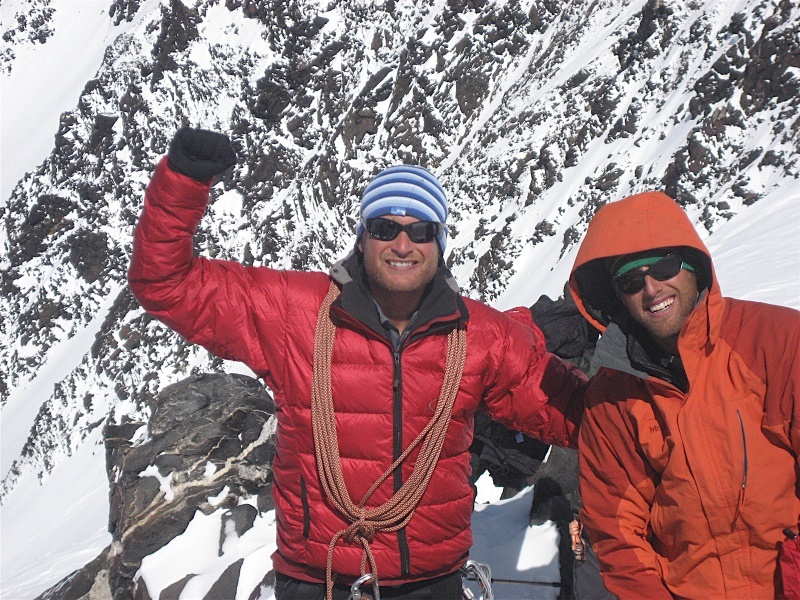 While descending Denali Pass, we spotted three skiers skiing steep couloirs on Black Rock Peak to our right near Denali’s north summit It turned out that it was Chris Davenport and crew who were skiing many 1st descents on Denali. We returned to 17,200′ high camp around 11pm making a roundtrip summit day of 12 hrs or so with almost an hour of that time on the summit. The next morning we woke up, made breakfast, Rob gave me a cup of his english milk tea of which I forget the name, and we packed up our packs. We departed high camp around 10am and descended the long and exposed ridge back to 16,200′ and the fixed lines down the crux headwall back to 14,000′ camp 4. We loaded up our buried cache of food at camp 4, ate lunch, rigged up our sleds again (we had left them at 14,000′ camp 4), and departed for camp 3 at 11,000′. We saw Chris Davenport while leaving camp 4 – I guess they were staying up there a few more days to ski some more lines. We were able to consolidate 4 sleds into 3 now having eaten much of the food and used much of the fuel. This was a necessary thing to do because on the descent the climber behind controls the sled as if having it on belay so it does not slide off the route or into the climber in front. We made it to camp 3, dug up our cache, skis, and skins and wondered whether we should camp here for the night or continue on down the mtn. We heard reports that the lower portions of the route mainly on the Kahiltna Glacier were pretty broken up with crevasses because of the warm daytime temperatures down low while we were up high on the mtn. So, we decided to continue descending since it was the evening now in order to travel while the glacier was more frozen and hopefully safer. If you’ve ever tried to ski down with a 50 lb pack on and a very awkward sled between your legs or in front of you, its a frustrating but pretty hilarious scene. 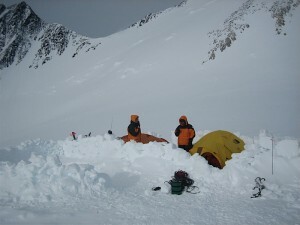 At about midnight of Day 11 (after leaving 17,200′ high camp at 10am the same day), we almost reached 7,800′ camp 1 without incident until we came across a group of rangers and a guided Alaska Mounatineering Group trying to rescue one of their clients who fell into a crevasse directly beneath the route. We thought about helping out but we just waited – they had enough people involved. 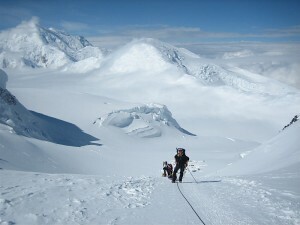 After an hour, they pulled their client out along with his sled and the rangers probed a new route around the crevasse. The last 6 miles of the route back to basecamp after this crevasse rescue incident were definitely the most taxing and nerve-racking hours of the expedition. We had already been up for 14 hrs that day and had a 12 hr summit day the day before and now we were facing and negotiating a very cracked-up Kahiltna Glacier because of all the warm temperatures. It was very slow going and our routefinding skills came in handy in finding new routes around crevasses that appeared but were not there on our ascent (or they were there, they were just covered up). Rob and Kevin had caught up to us at about 3am on Day 12 when Kevin’s sled fell through a snowbridge and was dangling into a crevasse pulling Kevin in. Sean was anchor on our roped team and the closest to Rob and Kevin and fortunately Rob and Sean were able to pull Kevin’s sled out of the crevasse without cutting the rope. Finally, at 6am on Day 12, we made it back to 7,200′ basecamp after climbing uphill for the last 500′ on appropriately named “Heartbreak Hill”. We had descended 10,000′ from high camp to basecamp in about 20 hrs straight and we were pretty spent, though more sleepy than physically tired. 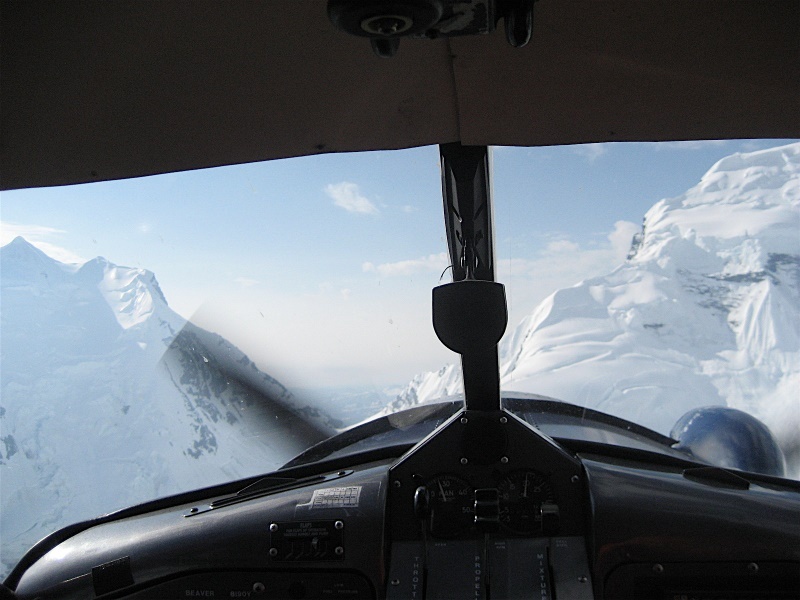 Fortunately, we were able to get on one of the first available planes off the glacier back to Talkeetna and Kristine got to sit co-pilot and enjoy the roller coaster ride through the Alaska Range. Once back in Talkeetna, Sean’s family, local news, and ESPN all greeted him as we got out of the plane since he had completed his final 7 summit. We unloaded our gear and changed into our regular clothes and went to lunch with Sean , his family and friends. I severly passed out on our gear afterwards waiting for our shuttle back to Anchorage because I was so tired mainly from being up for 2 days straight. I guess the summit day and 20 hr descent had something to do with me being tired too, huh? The shuttle ride back to Anchorage was crazy…we were trying to sleep sitting up leaning on each other but we always woke up to the driver passing someone going 90mph all while pullinga trailor with our gear in it. We were seriously scared and then thankfully J said to the driver, “Sir, you are scaring people, can you please slow down?”. I think he slowed down somewhat but boy were we glad to get to Anchorage. Our friend Rob Baird picked us up and took us and our gear to the house he was looking after again. J flew back to Denver the next day while Kristine and I stayed in Anchorage for almost a week – our first of many honeymoons. Two days after we got off Denali our friend Rob was running a half marathon so Kristine decided to run it with him – I thought she was crazy, but boy is she a machine! I went to the race with them but took a stroll to a mountaineering shop and drank five lattes at a coffee shop instead. We had a great time in Anchorage doing a couple of short hikes in the Chugach Range, roadtrips down to the Kenai Penninsula and Seward, celebrating my 30th bday, and taking a glacier cruise. However, we were definitely ready to return back to CO but were so thankful and happy that we had a safe and successful climb of Denali. I hiked a 14er the day I returned back to Vail with my good buddies and boy did it feel great to have shorts and trail shoes on and to be just carrying a 5 lb daypack!